Copper is essential for life, yet highly reactive and a potential source of cell damage. Therefore, all cells possess copper homeostatic mechanisms to keep intracellular copper at safe levels. However, under conditions of excess environmental copper, homeostatic system become overloaded and intracellular copper rises to toxic levels. Possible toxic effects of copper span a range of mechanisms and it cannot be known with certainty which mechanism is active to what extent in a particular bacterium of vast and varied bacterial world. 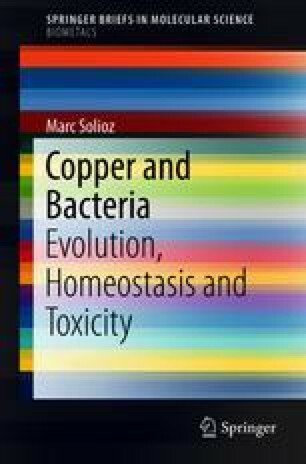 For common laboratory species like Escherichia or Bacillus, the concept has emerged that the main toxic action of copper is the replacement of iron in iron-sulfur cluster proteins, thereby inactivating essential enzyme functions.